On February 24th at 2pm Pops in Dunsmuir will open its doors to celebrate Black History Month with a screening of the 2011 film FROM THE QUARTERS TO LINCOLN HEIGHTS. Also on the bill that afternoon is Tinasha La Raye performing spoken word. 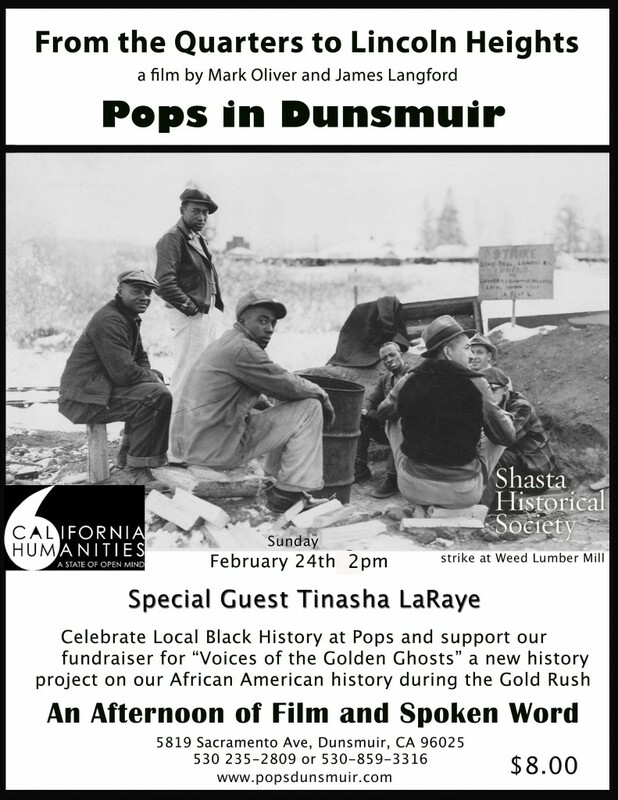 This is a fundraiser for the project VOICES OF THE GOLDEN GHOSTS, a new project on the African American History of our North State during the Gold Rush. Prior to this current project there has been no representation of the African Americans who came to Siskiyou County to mine gold during the 1850’s and 60’s. This new project will describe the political and social elements Free and Enslaved African Americans faced in the Gold Fields, Pops founder Victor Martin and bandmate Kenny Blockman will be presenters in the final presentation. Come watch the film and some spoken word and support this new groundbreaking project. Directed by Mark Oliver and Produced by James Langford and Oliver. The documentary From the Quarters to Lincoln Heights tells the story of how a large African-American population in the small northern California towns of Weed, Mc Cloud and Mt Shasta came to root themselves in such an unlikely place. Migrating from the southern US in the 1920’s they came to work in some of the world’s largest lumber mills. The film explores how these unique communities of African Americans thrived in these multi-racial rural lumber towns. This film presents this little known history, revealing the early inter-racial relationships that existed in Northern California. Similar to many stories of migration these African Americans moved from the southern states to find work and new opportunities that were opening up in the rural northern part of California because of the lumber boom. As Black Americans moving from the racially segregated south to the west, they discovered that many things were not that different. They lived in segregated neighborhoods and were not allowed to eat with whites. These are the forgotten aspects of California’s history unless you lived through them. Comprised of over 60 interviews this new documentary gives a voice to the many African Americans who lived and worked in this remote part of California. Initially funded by the California Council for the Humanities the film went on to show through the United States and won awards in North Carolina and Berlin Germany. Tinasha is an Oklahoma native who identifies as a renaissance artist. This poet, actress, director, filmmaker and former Miss Black Oklahoma is a graduate of Oklahoma City University with a Bachelor of Arts in Theatre Performance and a Master of Liberal Arts with an emphasis in Screen Writing and Directing. Some of her Oklahoma acting credits include Michelle in Dreamgirls and Lil’ Inez in Hairspraywith Lyric Theatre, Nettie in The Color Purple with Poteet Theatre and Mrs. Muller in Doubt, a Parable with Carpenter Square Theatre. In Los Angeles, Tinasha originated the role of PFC Linda Baldwin in the World Premiere of StandOff at Highway #37 and she was also featured in Queenie Pie, a Duke Ellington Opera with Long Beach Opera.